You can create your own vectorization settings with Toon Boom Harmony. 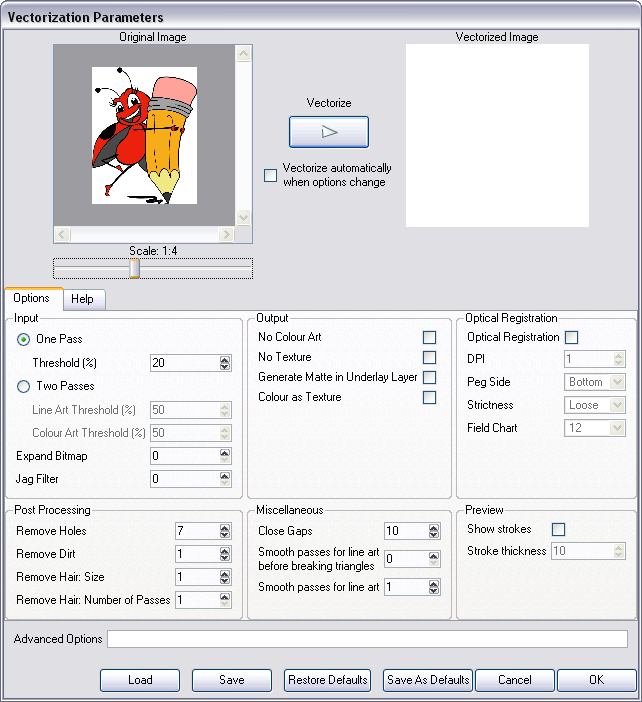 The vectorization parameters you will create here can be saved, shared and also inserted into the VectOptions.conf file used by the Harmony Scan and Control Center modules when scanning or vectorizing a series of drawings. You can use an interface to select and test the different options and you can also type in some advanced settings. 1. Select File > Import > Images. You can also open it from any other Import option that allows you to customize the vectorization parameters (i.e. From Scanner). 2. Browse for and select your file and decide on your Layer options. 3. In the Vectorization section, click the Add New Preset button. 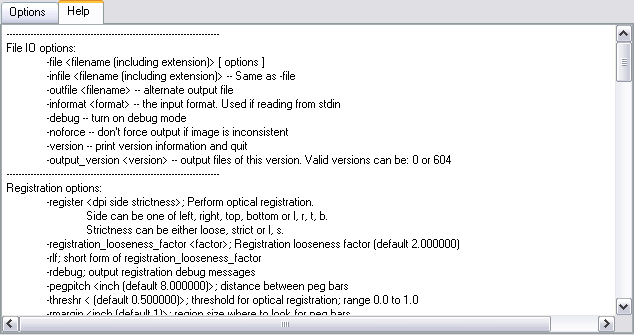 The Vectorization Parameters dialog box appears. • If you select one pass, one threshold value will be applied to both the Line and Colour Art. For drawings with distinct vector-style lines of mattes, you only need one pass. • If you select two passes, you can apply a different threshold value to each layer. 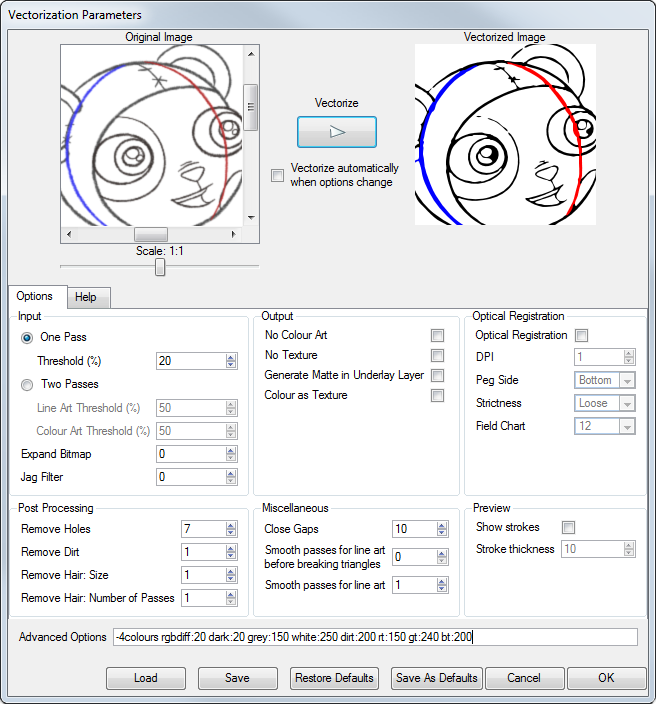 For grayscale drawings, you may want to pass through the vectorization process twice to apply different threshold values to the Line and Colour Art layers. • Threshold: Determines which values in the scanned image are considered part of the Line or Colour Art layer and what will be eliminated from the vectorized drawing, 0% (zero) is white and 100% is black. The threshold is between those two values. • Expand Bitmap: Enter a value to scale the bitmap to detect small variations in the line. Use this option if you scanned a grayscale image and want to preserve small variations in the texture that will be applied to the line art. 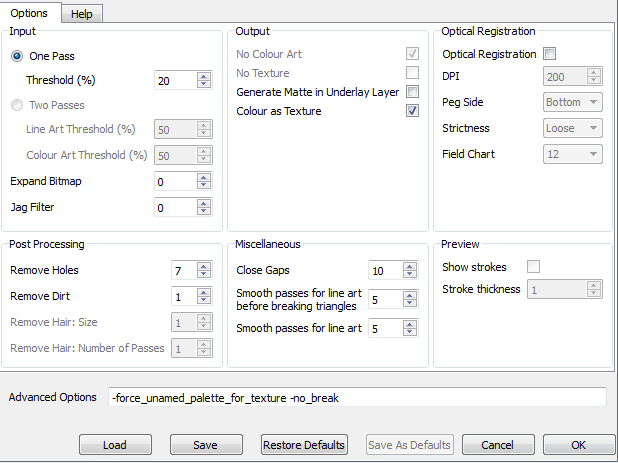 • Jag Filter: Enter a value to scale back the bitmap to remove some of the line’s roughness. If you have a drawing that appears quite rough, use the jag filter to eliminate excess strokes in the final drawing. • No Colour Art: Does not generate filling zones in the Colour Art layer. • No Texture: Does not generate texture in the Line Art in the final images. Select this option to create solid lines in the final Line Art. • Generate Matte in Underlay Layer: Creates an opaque zone behind your drawing’s lines to avoid seeing through the layers. • Colour as Texture: Converts colour values into a texture layer. The optical registration options are used to automatically align drawings based on the position of peg holes on the animation paper. The peg holes must appear in the scanned drawings for the optical registration to work. • Optical Registration: Use peg holes to align drawings optically. • DPI: Type the dots-per-inch value of your image. You must enter the same value as the DPI used to scan the image. • Peg Side: Select the position of the peg holes on your drawings. Identify whether they are on the top, bottom, left or right. • Strict: The peg holes must be in a tightly defined area to be recognized. • Loose: The peg holes can be recognized somewhere in a larger area. This is the recommended setting. • Field Chart: Select 12 or 16 to indicate the size of your animation paper. • Remove Holes: Removes holes of a specified value that might make painting difficult. • Remove Dirt: Removes stray marks and dirt of a specified value. Try a value around 500. • Remove Hair: Removes small strokes that have no line art. • Remove Hair: Number of Passes: The number of times the drawing will be analyzed to identify hair marks. • Close gaps: Closes gaps in the Colour Art so that you can paint it. • Smooth passes for Line Art before breaking triangles: The number of times the smoothing operation runs before creating the triangles that break lines in your drawing. If unnecessary triangles are appearing in your drawing, increase this value. • Smooth passes for Line Art: The number of times the smoothing operation is performed after the triangles have been created. This further smooths the Line Art. • Show strokes: Shows the strokes in the Vectorized Image panel. • Stroke thickness: Shows the size of the strokes. The Help tab contains the most advanced vectorization settings. You must type those in the Advanced Option fields located at the bottom of the Options tab.